Today is the first day of the Adobe MAX conference in Seoul. It’s great to talk to local mobile developers, and checking out some local mobile devices. For example, Samsung has a Windows Mobile slider phone, which has a touch screen and a tiny antenna that receives digital satellite TV. The video quality is really good as it is all digital signal. It runs on the standard Windows Mobile system, so Flash Lite 2.1 is also available. 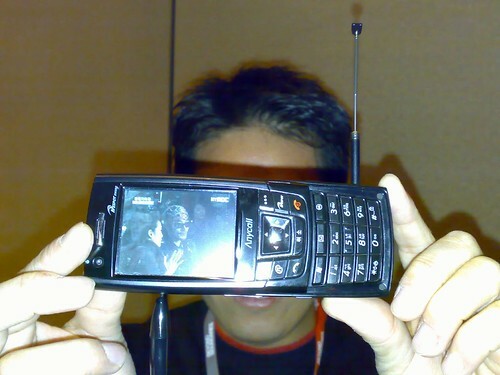 I was told it is free to watch TV on the mobile phone. It’s great to be back in Asia. Getting to hang out with the usual crowd and meeting new people are always good reasons for going to these conferences. I think there are over 1000 attendees, coming for the two-day event. My presentation on “Connecting to External Data Services” (for Flash Lite) is on tomorrow. 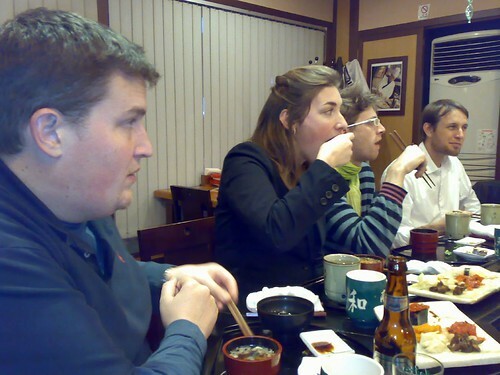 There’s a speaker dinner tonight, and I’m looking forward to the traditional Korea dinner. Last night, a couple of speakers went out for a late dinner at a nearby Japanese restaurant. The food was really good! Thought I should update the blog about my upcoming trip to Asia, specifically to Seoul, Hong Kong, and Shanghai. Adobe invited me to speak at the APAC MAX conference in Seoul (Nov 14-15), on mobile Flash development. Speaking at the Seoul conference should be an interesting experience, as I don’t read or speak Korean. There will be live translation during my presentation though. Another first for me is the length of the presentation – it’s 80 minutes long! Although I’ve done a back-to-back repeat presentation at the first FITC (2 hours total), this will be the longest single presentation I’ve done. On a personal note, I’m very interested to see the latest mobile devices in Asia, and learn about the mobile culture there. Of course, it would be my pleasure to meet other Flash developers and designers in all three cities too. In case anyone is wondering my whereabouts, I’ll be in Seoul from Nov 11 to 16. Hong Kong from Nov 16-22, Shanghai from Nov 22-26, and back to Hong Kong from Nov 26-Dec 4. Should have broadband internet access in all three cities, so business as usual (except I’ll be in a tourist mood)! P.S. Picked up a Vonage V-Phone, even though I already have a VoIP line (along with my regular landline). Reason is simple, no bulky phone adaptor and handset to pack, it’s just a small memory stick with some circuits. Cool gadget for travelers to keep in touch with folks back home! HSDPA (aka 3.5G) now available here! It’s been a long wait for 3G in North America, in particular here in Canada. Yesterday, Rogers Wireless announced the launch of HSDPA (High Speed Downlink Packet Access) here in the Toronto / Golden Horseshoe region. HSDPA is a 3.5G wireless protocol at broadband speeds, and it is compatible with EDGE/GPRS/GSM networks. Availability is from Oshawa to Niagara Falls, including the Greater Toronto Area (Brampton, Burloak, Etobicoke, Hamilton, Mississauga, North York, Oshawa, Scarborough, Richmond Hill, Pickering, Newmarket, Markham, St. Catharines, Oakville, Burlington, Toronto, and Niagara Falls). Access to this network is through HSDPA-enabled phones, or the Sierra Wireless AirCard 860. The card will also be made available to Fido customers from November 24. Rogers is offering unlimited email and browsing for 3 months on data plans of $60/month or more. According to the news release, existing data price plans apply. Being a Fido customer with an unlimited data plan, I wonder if I’m eligible for unlimited HSDPA at the same price?